Meteo 480M (Undergraduate Research) is encouraged for all Meteo majors in the Atmospheric Science option and is an elective for all other options in the Meteo major. Meteo 580 (Communication of Meteorological Research) is required of all Meteo MS and PhD students. Students perform research under the guidance of a faculty member that is summarized in an AMS-style conference preprint paper. Students also give a timed 12-minute oral presentation. This course seeks to improve each student’s ability to communicate science in both written and oral presentations. Please note that this outline serves only as a general guide to the course. The actual topics covered may vary at the discretion of the instructor. Alley, M., 1996: The Craft of Scientific Writing. Third edition. Springer, 282 pp. a 12-minute oral presentation (THE TALK). The preprint may be a succinct summary of your research work or may be on some other topic approved by the instructor. The preprint and associated talk can also be from a conference that you are preparing to attend or have recently attended if you (and not your advisor/co-authors) did most of the writing and if you thoroughly critique and revise the preprint based on what you have learned in this course. The goal here is for all of us to learn to improve our written and oral presentations. Undergraduate students (3 credits): 1/3 of your grade comes from this lecture portion of the course and the other 2/3 comes from your research advisor. The preprint should be a succinct summary of your research. Be sure to contact your research advisors early in the semester and ensure that they know this grading policy for Meteo 480M. Then e-mail me their names. Graduate students (1 credit): The entire grade comes from the written and oral assignments described above. These assignments will help you prepare for writing and defending your thesis. PhD students: This course prepares you for the university-mandated Technical English Competency requirement. For this requirement, each PhD candidate must write an acceptable 2-4 page AMS conference preprint, and give an acceptable 12-minute oral presentation. An ad-hoc panel of faculty members (none of whom are the student’s advisers) evaluates each of these two requirements as accomplished during this course. Note: passing Meteo 580 does not necessarily mean passing the Technical English Competency requirement. We will hold a mini-symposium on one or more days near the end of the semester for the 12-minute talks. Students are expected to do their own writing. Do not copy text from another person's paper or from a World Wide Web site and present the material as your own, because that is plagiarism. Other people's work should be summarized in your own words and properly referenced. Such reference provides necessary background for presenting your work. Students who plagiarize will receive a grade of F in this course. This course adopts the EMS college policy on academic integrity. Please see: http://www.ems.psu.edu/current_undergrad_students/academics/integrity_policy. Students can demonstrate the ability to complete and write a technical report on a research project overseen by a faculty member or other. To produce graduates who possess quantitative, scientific reasoning skills that can be applied to atmospheric problems. To produce graduates who are equipped to contribute to solving problems in the atmospheric sciences and related disciplines, through service in business or as educators, researchers, and leaders in academia, government, the private sector, and civil society. Students can demonstrate knowledge of effective scientific writing principles, including proper organization of the material and use of good. Students can demonstrate knowledge of good practices in reviewing and editing atmospheric science manuscripts. Students can demonstrate knowledge of issues underlying proper scientific ethical behavior, such as plagiarism and authorship. Effective: Fall 2014 Ending: Fall 2014 Future: Fall 2014 Prerequisite: junior or senior standing as a Meteorology Major Note: Class size, frequency of offering, and evaluation methods will vary by location and instructor. For these details check the specific course syllabus. METEO 580 Communication of Meteorological Research (1) Methods for effective written and oral presentation of meteorological research are reviewed. Note: Class size, frequency of offering, and evaluation methods will vary by location and instructor. For these details check the specific course syllabus. Students in this class are expected to write up their problem sets individually, to work the exams on their own, and to write their papers in their own words using proper citations. Class members may work on the problem sets in groups, but then each student must write up the answers separately. Students are not to copy problem or exam answers from another person's paper and present them as their own; students may not plagiarize text from papers or websites written by others. Students who present other people's work as their own will receive at least a 0 on the assignment and may well receive an F or XF in the course. Please see: Earth and Mineral Sciences Academic Integrity Policy: http://www.ems.psu.edu/current_undergrad_students/academics/integrity_policy, which this course adopts. Penn State welcomes students with disabilities into the University's educational programs. Every Penn State campus has an office for students with disabilities. 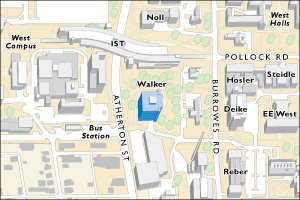 The Office for Disability Services (ODS) Web site provides contact information for every Penn State campus: http://equity.psu.edu/ods/dcl. For further information, please visit the Office for Disability Services Web site: http://equity.psu.edu/ods. In order to receive consideration for reasonable accommodations, you must contact the appropriate disability services office at the campus where you are officially enrolled, participate in an intake interview, and provide documentation: http://equity.psu.edu/ods/guidelines. If the documentation supports your request for reasonable accommodations, your campus’s disability services office will provide you with an accommodation letter. Residence Instruction: Campus emergencies, including weather delays, are announced on Penn State News: http:/news.psu.edu/ and communicated to cellphones, email, the Penn State Facebook page, and Twitter via PSUAlert (Sign up at: https://psualert.psu.edu/psualert/). METEO 480M Undergraduate Research (3) A research thesis will be prepared. A written and oral presentation required. METEO 480W Undergraduate Research (3) A research thesis will be prepared. A written and oral presentation required. Meteo 580 is the preparatory course for the Technical English Competency Exam with speaking and writing requirements matching that for this exam. In Meteo 580 and the exam, students give a rigorously timed 12-minute talk. As part of the course, students are provided lots of detailed feedback on their Meteo 580 talks and are told in the course that they can give a revised version of the talk for the Tech exam. Also, students are counseled in the course to practice all of their talks with an audience to get helpful input. Given that many students have little or no technical speaking experience, having faculty and others provide students feedback on their talks to help them improve their speaking ability is allowed. The paper written in Meteo 580 is also of the same format as that for the Technical English Competency Exam. As part of the class, students are given feedback on earlier drafts of the paper by fellow students and the instructor; as for the talk, a revised version of the paper can be submitted as part of the exam. Faculty input is allowed on this exam paper so long as the sentences are critiqued, but not rewritten by the faculty; the intent is for the students' writing ability to be evaluated, which cannot be done if the faculty rewrites the paper as part of the input phase. Thus, a paper submitted as part of the exam is to be single-authored by the student.